Dhansak is an intensely flavored Parsi Dal with aromatic spices. It is traditionally prepared with mutton & served with caramelized brown rice. Dhan means lentils & sak is vegetables. It is also available in restaurants with chicken or just plain vegetarian. It is not served at happy occasions but because of its popularity it is sometimes served at weddings & Navjotes. Dhansak is very tasty, healthy & full of nutrition. It is mildly spicy, pleasantly sweet & aromatic. 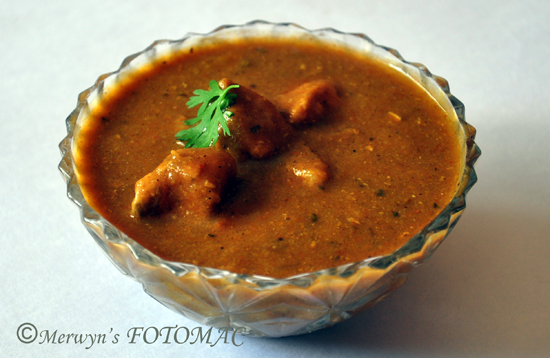 Dhansak is perfect to serve at a party & it is one of our favorites. I have enjoyed this dish at many Parsi homes, Parsi occasions & at restaurants. In fact, I love all Parsi food… each one of them I have relished & savored every morsel. I prepare Parsi food quite often especially Dhansak & Brown Rice. Earlier, very good Parsi Dhansak Masala Powder with perfect blend of spices was easily available & it was very handy to use at a short notice but now it is no longer available. I used to love this spice powder but now I make my own as I am not happy with what is available in Pune. 2 dry Kashmiri Chillies/1 tbsp. Kashmiri Chilli Pwd. Heat a tawa/wok/pan on med. heat & dry roast all the spices (except the nutmeg & turmeric pwd.) till they begin to release their aroma. Cool the roasted spices & then grind to a fine powder in a spice blender/grinder. Transfer to a bowl & then mix in turmeric pwd. & grated nutmeg. Combine & blend well. Your very own Dhansak Spice Powder (Masala Pwd) is ready to be used in the Dhansak preparation. First wash the chicken pieces & marinate with ginger-garlic paste, 1 tsp. chilli pwd. & ½ tsp. turmeric pwd. Pick & rinse the lentils/dals & soak them for at least ½ an hour. Mix the all the chopped vegetables, lentils, green chillies, ½ tsp. turmeric pwd. & pressure cook with sufficient water till soft. Strain the mashed dal & vegetable mixture through a strainer or you may use a blender. Heat a sufficiently large & deep pan with oil till hot. Add bay leaves. Fry the sliced onions till crisp & lightly golden brown. Now add the marinated chicken & fry till rawness disappears. Add the Dhansak masala powder & sauté for a few seconds. Add tomato puree & sauté for about 3 mins. Add the thick lentil puree & stir well. Let it come to a boil & then add tamarind extract/paste & sugar/jaggery. Combine well. Adjust salt to taste & let it simmer for about 5 to 7 mins. till you get a good aroma. The Dhansak should be sufficiently thick & of pouring consistency. Garnish with crisp fried onions & chopped coriander. Heat a tablespoon of pure ghee till hot & pour on the Dhansak. It tastes better the next day as the spices get totally infused in the Dhansak. 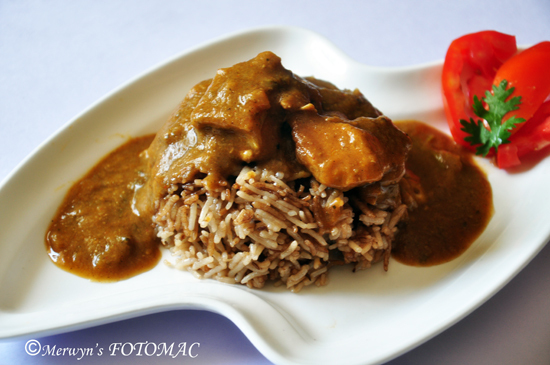 Serve hot Chicken Dhansak with Parsi Caramalized Brown Rice & salad. You shared this link on my Facebook page for EVeryday Exotic Spices and I reshared it on my GOOGLE+ page. I love spicy food! Especially chicken dishes!! Hope you visit our website when you have the time. thanks for sharing such and authentic recipe.